People do get their knickers in a twist when it comes to using PowerPoint! 1. Do I need a visual aid at all? Sometimes the best way to ‘show’ people is to paint a picture using your words. Get them to see, hear, feel, taste and smell through the power of your language alone. The pictures inside their heads are theirs then and all the more enduring because of it. 2. What does this visual ‘show’?. If it is ‘saying’ something then think again. Could you say it better? Should you be saying it so you have more impact and more power? 3. What is the purpose of this visual? If it is saying what you are saying, then one of you is not needed. And you are the human interest factor, the one people have come to hear, so get rid of the slide! You might choose to have a slide to reinforce a message, to help explain a message or concept, to change the energy in the audience, to change the focus of the audience. Just be clear about the purpose and if there is no purpose FOR THE AUDIENCE in having the slide there – kick it out! 5. Are the slides there to help you or the audience? Each slide should earn its place in the deck as an aid for the audience. If you have included one in there to help you remember what to say or what comes next, then think again. What prompt could you use that won’t get in the way of people listening and engaging in your presentation? **I use a Pathway Planner with my clients which works a treat! Every slide up there should be to help the audience. 6. Do you need to provide handouts? If you do, create handouts specially for your audience with notes and information that can be read. Don’t fall into the trap of creating slides that also act as handouts. They won’t be good handouts and they are likely to be dreadful slides. Handouts are to be read and digested. Slides are to be seen and absorbed alongside the speaker’s delivery. My challenge to you then is to go through your slide deck and have a good clear out. 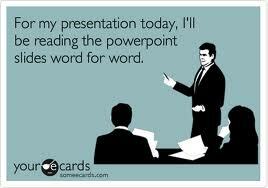 And if this post makes you think again about how you use PowerPoint, then I am a happy bunny today! If you would like to know more about how Catherine can help you in your presentations, then email on catherine @catherinesandland.com. 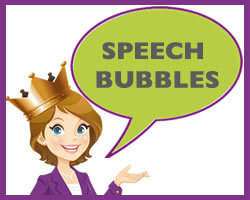 To develop your speaking skills through an online learning programme supported with one to one sessions with Catherine, click here for information about The Expert’s Presentation Game Plan.